In line with the league formats with various sports in India, Kho Kho is coming up with its own, Ultimate Kho Kho. KKFI, the Kho Kho Federation of India along with Dabur’s Amit Burman, today launched the country’s first franchise-based league for the sport – Ultimate Kho Kho, in the presence of Honorable Minister of Youth Affairs & Sports, Col. Rajyavardhan Singh Rathore. The league comes into shape after the monumental success of Kho Kho at the Khelo India Youth Games 2019. Dabur’s Vice Chairman Amit Burman has decided to collaborate with KKFI to support the development of this league. Kho Kho Federation of India and Amit Burman have brought on board Tenzing Niyogi, former sports advisory leader at EY, as the CEO of the league. “I always felt it is important to encourage other sports, especially those that bring communities together and promote active lifestyles to Indian youth. Kho Kho is the first ‘run and chase’ format sport and with the recent success of Kho Kho in Khelo India Games 2018 and 2019, it further signifies the massive fan following in states of Maharashtra, Punjab, Delhi, Kerela, Karnataka, Andhra Pradesh, Madhya Pradesh to name a few. The biggest differentiator is – While other sports leagues are busy developing the grassroots program, Kho Kho is deeply entrenched in rural India across every state with school programs. 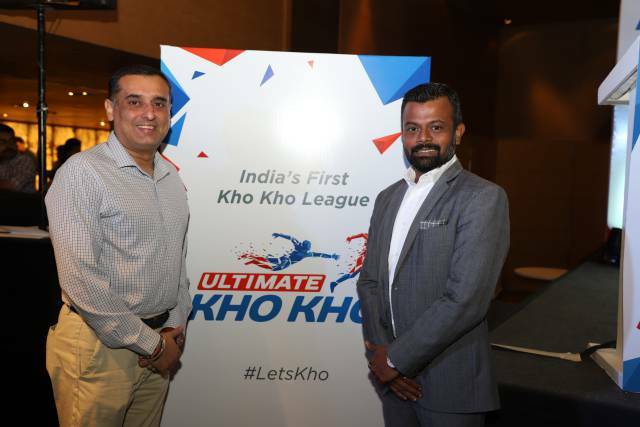 Conglomerates, Business houses, Brands, Celebrity team owners will engage with fans from season one for the sheer recognition of the game”, said Mr. Tenzing Niyogi, CEO, Ultimate Kho Kho. Present among the dignitaries were also Mr. Rajeev Mehta – Chairman, Kho Kho Federation of India (KKFI) & Secretary General, IOA, who expressed his delight at the launch event, “It is a moment of joy and pride for all of us to announce the launch of the Ultimate Kho Kho League. The Kho Kho Federation of India is working extensively, with support from the Indian Olympic Association, towards making the sport popular with the country’s youth. “Ultimate Kho Kho is an initiative to bring the sport to the forefront and make it the most sought-after league for a home-grown sport in India. The league will witness participation of key athletes from India and other Kho Kho playing nations.’ said Mr. Sudhanshu Mittal, President, KKFI & Vice President, IOA. The first edition of Ultimate Kho Kho will feature eight teams named after the country’s prominent regions. There will be an initial draft of players where Kho Kho athletes from across the world, including England, South Korea, Republic of Iran, Bangladesh, Nepal and Sri Lanka, will be made part of the eight franchises. The teams will also have the opportunity to include U-18 players in their squad which will help develop a pool of young Kho Kho players in the country. A Kho Kho match consists of 4 innings of 9 mins each and will be played on specially developed mats in state-of-the-art indoor stadiums. It will also have some minor tweaks in the format to make it more visually appealing for fans and television viewers. The 21-day event is set to have a double round-robin format which will see the eight teams heavily involved in competition through the season. Kho Kho ranks as one of the most popular traditional sports in India, along with kabaddi. It is a modified form of ‘Run Chase’ which in its simplest form involves chasing and touching a person, requires speed and agility. It is considered one of the strongest tag-team sports.